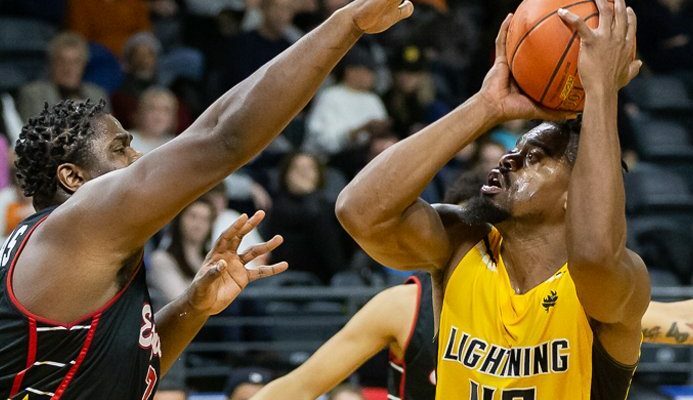 The London Lightning topped the Windsor Express 147-144 after double overtime on Thursday. London took a 32-24 advantage by the end of the first quarter, but the Express cut the Lightning’s lead to three points as the game entered halftime. London continued to dominate in the third and held an 87-75 at the end of the third, however, the Express fought back throughout the fourth to tie the game 114-114 in the final 14 seconds and force overtime. The first five minutes of OT ended in a 127-127 tie but London was able to regain their lead in the second overtime frame to win with a three-point advantage. Marcus Capers was the top scored for London with 25 points and nine rebounds, while Kevin Ware Jr. put up another 23 points and had 10 rebounds. Xavier Moon also added 20 points and six assists. Juan Pattillo and Chris Jones both scored a game-high 35 points for Windsor. Tyrrel Tate added another 20 points and seven rebounds. The Lightning are at home on Saturday to battle the KW Titans at 7 p.m. And then on Sunday, the Express take on the Lightning again in London at 2 p.m.